Cory Brandon of Husson University, pictured in 2017, passed for 223 yards and two touchdowns on Saturday as the Eagles beat the University of New England 47-7. Solomon Hassen rushed for 245 yards and two touchdowns Saturday afternoon as the Husson University football team rolled past the University of New England 47-7 in a nonconference game at the newly renovated UNE Blue Storm Stadium in Biddeford. The game was the first-ever home contest for UNE (0-2), which is playing its first year of varsity football. It marked the first time since restoring its football program in 2003 that Husson (1-1) had played an in-state opponent. Hassen, a 5-foot-8, 180-pound freshman from Crenshaw High School in Los Angeles, sparked a Husson ground game that amassed 383 yards on 50 carries. His 28 carries included a 41-yard touchdown run late in the first quarter and a 1-yard scoring run in the second period as Husson built a 33-0 halftime advantage. Miece Loureiro added 66 yards and a touchdown on eight carries for coach Gabby Price’s club while Ty Bassett had 53 yards and a score on three attempts. Husson senior quarterback Cory Brandon completed 17 of 25 passes for 223 yards with three touchdowns. Classmate Kyle Gaudet paced the receiving corps with seven catches for 65 yards and a touchdown, while tight end Keyshaun Robinson had five catches for 62 yards and a score. Bassett added three receptions for 60 yards and a TD. Jake Dobos led Husson’s defense with eight tackles and one of five interceptions Husson recorded against UNE quarterbacks. Elvin Suazo added six tackles, a quarterback sack and an interception while Quan Soyini, De’Wayne Smith and David Redmond also had interceptions. Husson’s defense also held UNE to minus-21 rushing yards on 17 attempts. 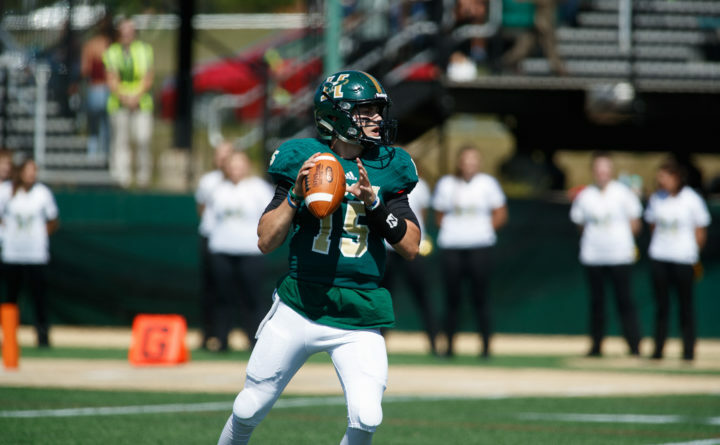 Peters finished the day 26 of 41 passing for 268 yards with one touchdown and four interceptions, with the Nor’easters’ Ryan Gaboury making six catches for a game-high 104 receiving yards and a touchdown. Husson will play its 2018 home opener next Saturday against Western New England. UNE travels to Virginia to face Hampden-Sydney University.